If you don’t know? I’m not the biggest fan of shopping. In fact, it’s pretty safe to say, I loathe it. But here’s the thing, we’re hosting Kevin’s family for Thanksgiving dinner this year (we switch off with his two sisters, so this means we host dinner every third year), it’s our turn, and we use these dinners as an excuse to spruce up the house a little bit. We did the kitchen back in March, now, it’s time to turn our focus on the living room and dining room. After we finished our weekly grocery shopping torture errand, Kevin and I went to look go look at “our” sofa and love seat. We’ve been looking at this one set for a few weeks now and we keep coming back to it. And the cherry on the milk shake? The set was on sale. In fact, if we paid cash, they would knock an extra 20% off the price. But still, we hesitated. We hadn’t checked out one last furniture store and Kevin, being Kevin, would never let me live it down if we bought this set and then we saw something else we might have liked better. (And yes, we would known about it because even though we buy something, Kevin still looks for that object long after the transaction has gone through. It drives me nuts! And then, God forbid the thing goes on sale – I never hear the end of it!!). It was time to pick the boys up from school by the time we finished looking at these sloppy seconds (*ahem*) and we took the opportunity to weigh the pros and cons of all of the sofas we looked at at this point. By the time the boys walked up to my car, we had decided to go ahead and buy the set we liked and take advantage of the sale price. (The sale ended at midnight tonight). We dropped the boys off, went to the store and bought our set. Kevin feels pretty good about it (the price was still a little high, but I’m El Cheapo and really, anything over ten bucks is too expensive in my book) and it will take about one or two weeks before they come in. Which works out perfectly, because we need time to get our floor installed. We headed to Micheal’s next. (Micheal’s is a craft store). I’ve been toying with the idea of painting our front bathroom and doing sort of a sunflower theme in there. 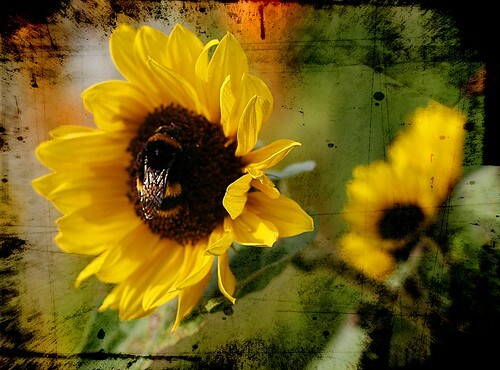 (Hence, the sunflower picture you see above). I have no idea where the sunflower idea came from, but that’s what I’m shooting for now. We bought four really big sunflowers for our over-sized vase (and they were 40% off – SCORE!). I’m even thinking about buying a few prints off istockphoto.com and getting them framed, but Kevin thinks this might actually end up costing us more than simply buying ready-made art. I’m not so sure – I have a few ideas up my sleeve on how we could possibly make it affordable, but again, we’ll see. After Micheal’s, we went to Kirkland’s to try and find a funky mirror to put over the new table in the foyer. (Side note: I did find a mirror that might work over that foyer table, though). Ugh. My brain is spinning from all of the home decor ideas swirling around. It’s like one big echo in there (because we all know my brain doesn’t take up too much space). I think if we can get this thing to come together, it’s going to look awesome. I hope. I finally made an appointment to get Dude’s senior pictures taken today. We only have until October 15th to turn in his senior portrait in order to make the yearbook deadline so we really need to get this taken care of. Dude has flat out refused to do the whole 50 poses-changing clothes thing, so we’re just going to get some head shots. I’m disappointed, but not surprised. Dude is my low-key sort of son. He likes to keep things simple and unassuming. His appointment is this coming Tuesday at 4:30. (I was surprised that they were able to get me in so soon). We’re going through About Faces Photography (love that name) and though I’m looking forward to getting some really good pictures of Dude, I’m not looking forward to the process. The package we’re paying for only has between 5 to 10 poses, so I’m sure it won’t take that long to get through, I just don’t know how comfortable (or terrified/annoyed) Dude is going to be. The gal told us that we will pick the photos we want right after the session. They are familiar with the school’s portrait requirements for the yearbook, so we won’t have to worry about that part. All we’ll have to do is pick out the best one and preen like proud parents. I’m sure we’ll buy extras. So that’s something else I need to do this weekend – take Dude out to buy him a new shirt. Preferably something a little nicer than a plain t-shirt, which is his style of choice. Dude also had a senior meeting this past week at school. I’ve yet to figure out what that was all about, so we’ll likely sit down and talk about that, too. Kevin is playing at a private birthday party tomorrow night, so I will be taking that time to get some work caught up. I have a feeling I’m not going to have a lot of time to get any work done this next week, what with us moving furniture and getting ready for the floor guy. We also need to hem Jazz’s band pants. Though he doesn’t have any idea when he’ll be required to wear his uniform for the first time, experience tells me it’ll probably be the next football game, which is this coming Friday. Two of my four textbooks have shipped. Yippee! I hope the other two get here in a timely manner. I”m really looking forward to starting this class. I caught Kevin looking at help wanted ads today. I talked him off the edge. I really think he should be the stay-at-home dad for a while and let me bring home the bacon. I’ve been drinking the Reliv. Actually, it’s one scoop of Reliv and one scoop of some sort of protein powder that Kevin drinks. I have to say, I do feel like I have more energy. But it’s early yet. Let’s see how it performs, long term. Kids bummed about going back-to-school? How about jazzing up their supplies just a bit? When I saw this first craft, my very first thought was, “I want one of these to put on my desk!” And no, I’m not kidding. Tell me these aren’t the coolest things evar! Have your kids turn a handful of office supplies into a busy fleet of cars and trucks. 1. Begin by cutting erasers with a knife (a parent’s job; kids can use scissors for this, but the cuts won’t be as straight). 2. Stack the erasers to make cars, trucks, and trailers. Pencil-cap erasers and automatic pencil eraser refills make good cargo. Use white glue to hold the pieces together. 3. To make tires, press thumbtacks into a piece of cardboard, color them with permanent markers, then remove the tacks and press them in place on the vehicles. This tubular art tote will keep your child’s projects safe on those masterpiece-crumpling bus rides home. 1. Make the strap by unrolling about 40 inches of duct tape and laying it sticky-side-up on a table. Place a second strip of equal length on top of the first, with the sticky side down. Carefully press the two together. 2. Attach the strap to one end of the mailing tube with duct tape. Measure the strap so that it’ll fit comfortably across your child’s chest, then cut off the excess and attach this end to the tube with tape. 3.Tote-ally Cool Wrap tape around both of the tube’s ends a few times. Have your child decorate the tube with permanent markers. Here’s a fun and fuzzy way to dress up your plain notebook. 1. Spruce up a plain spiralbound notebook with bold stripes by using tacky glue to stick pipe cleaners (the extrawide, fuzzy type work especially well) onto the cover. 2. The Colorful Coverup Notebook – Step 2 Fold the pipe cleaner ends against the top and bottom edges of the inner cover, then conceal them with a glued-on sheet of colored paper. When her son, Joel, was in first grade, Priscilla Johnson of Tigard, Oregon, quickly discovered that gentle reminders like “five more minutes” mean nothing to a child who doesn’t really understand the concept of time. So, she hung up this photocopy of her kitchen clock with the hands set to the time Joel had to leave for the bus next to the real clock to help him. Joel “is constantly comparing his ‘clock’ to our real clock, even telling me how much time we have left,” Priscilla told us. The result? “We make it out the door in record time,” she says. 1. Photocopy the face of a kitchen clock with its hands set to the exact moment your child needs to leave for the bus. 2. Mount the copy on a circular piece of construction paper, and hang it up next to the working clock. Take the shirt off your back, and turn it into a bag you can wear — on your back! This project calls for an eyelet or grommet kit, which may require an adult’s help to use. Sometimes it’s hard to commit a phone number or locker combination to memory. Here are a couple of innovative ways your child can use letters or colors to record hers. 1. Tie a long piece of beading cord or hemp to a lanyard hook or key ring. 2. Write the telephone number or locker combination your child needs to remember on a piece of paper. Then have her choose one of the codes below and string on beads as described. 3. Tie a secure knot at the end of the strand and trim the ends. 4. For a phone number, follow the key (see below in Tips) to select the appropriate letter for each numeral, and use ornamental beads as spacers between the area code, exchange, and last 4 digits. The chain on the left shows part of a phone number with the numbers 31-665. 5. For a locker combination, use the letters to form double-digit numbers, if needed, stringing spacer beads between them. 6. Color Codes: To represent a locker combination with colored beads, use one hue to represent units of 10, another for units of 1, and a third as a spacer. For a phone number, simply string together the same color beads so they add up to the correct digit, where 4 green beads in a row equals the number 4 and so on. 7. You can even add letter beads to the end of the string as a reminder of what number is being coded. For example, MC could stand for Mom’s cell phone. *Disclaimer: These crafts are from Family Fun. Family Fun did not compensate me in any way for this post. I’m simply a fan of Family Fun and thought I would pass these crafts on to you. 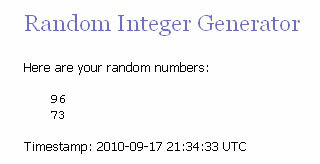 AND THE WINNER OF THE $25 GIFT CERTIFICATE IS: #96 GRANDGIVEAWAYS!!! THE WINNER OF THE $10.00 STARBUCKS GIFT CARD IS: #73 BETH SHEPHERD!! Thank you to everyone who visited and played!! I really enjoyed reading your answers! We’ll do this again in December! 1. Each answer you leave in the comment section counts as one ticket. (One comment per day, please). 2. Subscribe to my feed, receive another ticket. (Please leave separate comment if subscribed). 3. Follow me on Twitter, receive another ticket. (Please leave separate comment if following). On September 17th, at 4:00 p.m. CST, I’ll draw two winners – first place winner gets to choose a $25.00 gift certificate to an online retailer of his/her choice (see this page for store listings) AND, the second place winner will receive a $10.00 Starbucks gift card (U.S. residents only for the Starbucks gift card, please). Question 1. What’s something you intended to do today, but didn’t. Why not? Question 2. What’s something about yourself that you hope will change, but that probably never will? Question 3. Which do you prefer: the hustle and bustle of city life or the quiet and serenity of country life? Why? Question 4. What photos do you cherish from the past? Where do you keep them now? Question 5. Was there ever a time when it turned out you were right, in spite of many others who thought otherwise? Explain the situation. Question 6. If you could go back in time, what year would you visit? Why? Question 7: Are people trustworthy? Explain your answer. LAST QUESTION: How are you different now than you were before September 11, 2001? My answer: I’m more aware of what is happening in our country. Before 9/11, I never paid much attention to politics or policies or where our country was going. Afterward, I started paying attention, becoming more involved and voicing my opinions and concerns. It also gave me a much deeper appreciation for our great country and a renewed sense of pride – we truly live in the greatest country on the earth – we have earned that title and should not be ashamed of that fact. Ever. Thank you for playing along! I truly enjoyed reading your answers!